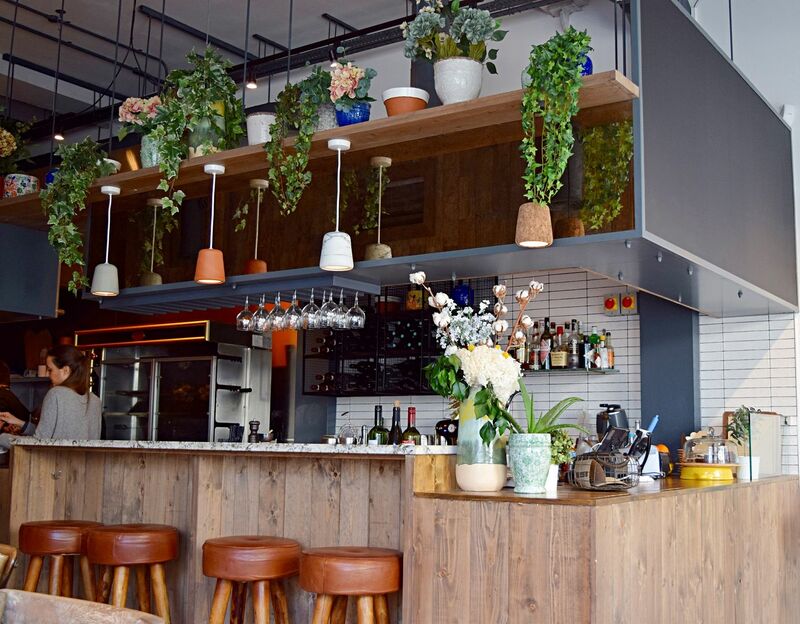 Cocotte is Notting Hill’s latest rotisserie restaurant, inspired by the chicken takeaway sites popular in Paris and it offers a healthy alternative for sit-in or takeout and for lunch or dinner. Entering into Cocotte you notice a small but very well put together restaurant. As we were led to our table you realise how light it is at the front of the restaurant, perfect for Instagram opportunities with the rustic wooden tables and then it gets slightly darker at the back where you have a full view of the rotisserie spit. Paula and I both mentioned how Pinterest like the table settings were and how pretty the main restaurant area was. The menu is small so you should expect the items they cook would be awesome or awful. Thankfully the first was the case for Cocotte. The service was prompt and the waiting staff did a great job to explain the healthy rotisserie concept. 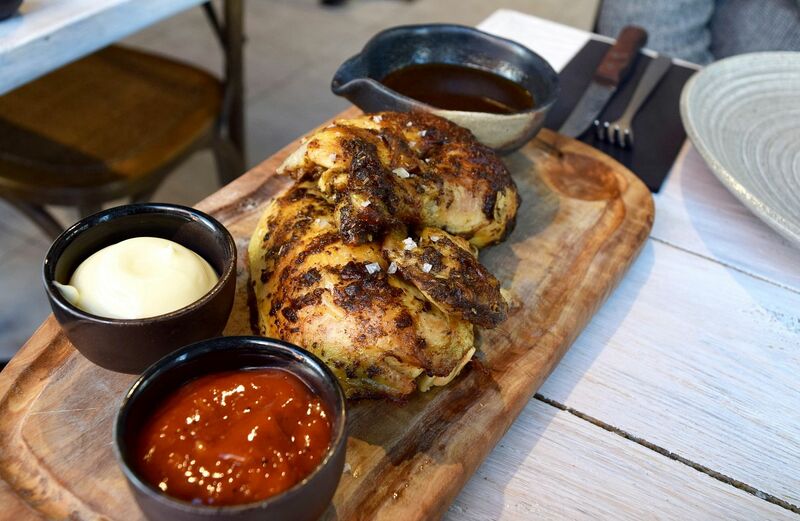 Cocotte’s chickens are marinated for 24 hours in their secret herbs and spices – trust me this is secret, we tried to find out the secret, but there was no tellings here. Before then being slow cooked for 3 hours at 93 degrees celsius and then finished on the spit to crisp the skin. Paula and I ordered a half chicken (quarter and full are available) and all three of the classic sides; mac and cheese, mashed potatoes and the roasted new potatoes. We went at 5pm and the restaurant was very quiet at this time so the food was brought to us very quickly and piping hot. You can tell the rotisserie chicken is marinated really well by the deliciously crispy, salty and slightly spiced skin. The chicken was so obviously moist you could see the juice on the surface of the meat underneath the perfectly crispy skin. The meat took on the marinade well, something many restaurants tend to struggle with and then overly rely on a strong sauce or rich gravy. Neither Paula or I usually eat chicken skin but we both loved it and really made the chicken dish. The sides were perfect accompaniments, the mashed potato was a great mix of butter and cream, velvety smooth, seasoned well and went great with the chicken. Definitely order the gravy sauce if you are going to have the mashed potato. The roasted baby potatoes were cooked in the secret sauce from the chicken and they were so tasty, so tasty in fact that I ate them all and even asked what they were cooked in and the sauce they were sitting in – of course secret sauce club resumed. 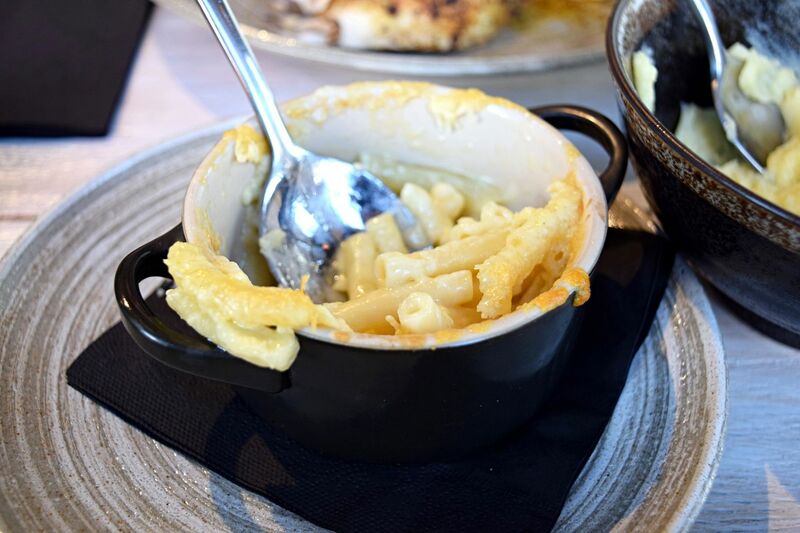 The mac ‘n’ cheese was everything you want, crispy cheesy top, soft pasta and ridiculously cheesy and went surprisingly well with the BBQ sauce. The BBQ sauce was smoky, peppery and had a sweet finish on your tongue which complimented it like a match made in smoky cheesy heaven. It was probably one of the best mac’ n’ cheese I have personally eaten. We had three sauces and lastly the truffle mayo which was luxurious, thick, and had a lovely finish of truffle. The truffle mayo went particularly well with the chicken and the roasted baby potatoes. If you would prefer a side salad, the truffle mayo would have worked really well as a thicker strong sauce. Probably not the healthiest option but definitely worth getting. If you are a regular reader of the site you will know Paula is a white wine fan and I am a red fan, we both enjoyed a glass of the Sauvignon blanc and Solano red wine that we had with our meal. 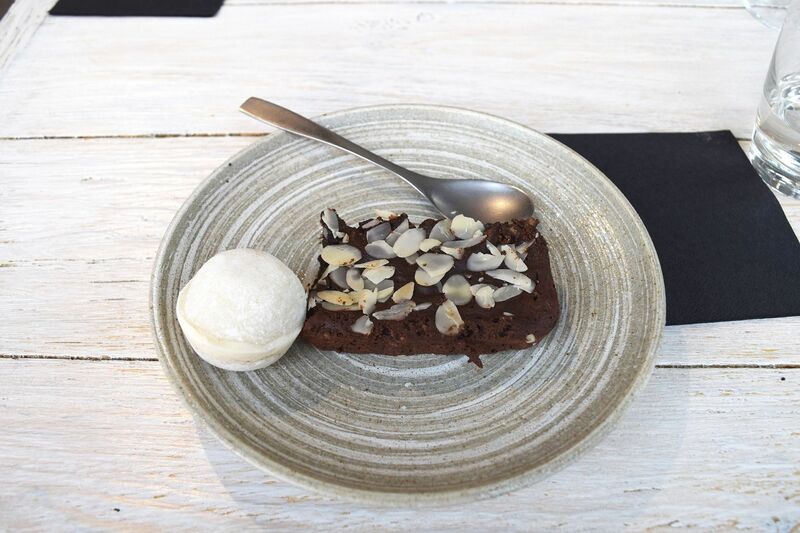 For dessert, I went for the date and coconut cake and Paula went for the chocolate brownie. 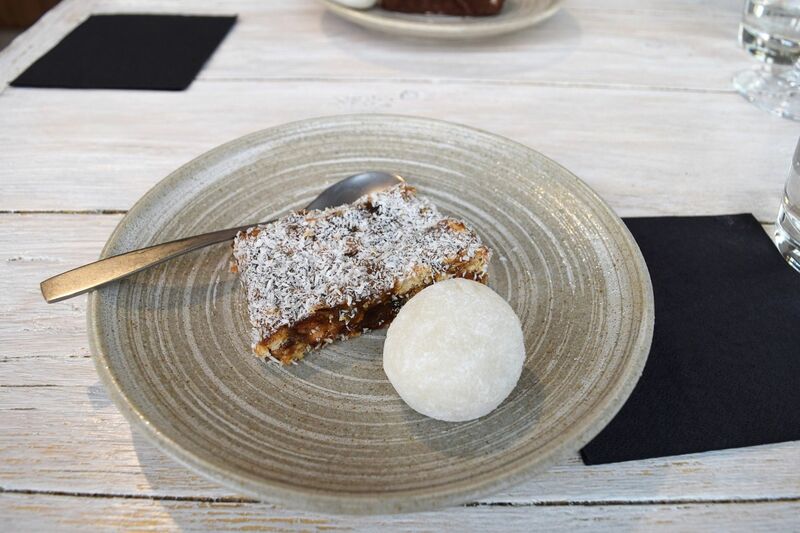 I really enjoyed the date and coconut cake and the chocolate brownie was good enough but not something Paula or I would necessarily order again. They also have a selection of Japanese mochi for desserts and so we finished our meal with desserts and a couple of fresh mint teas. 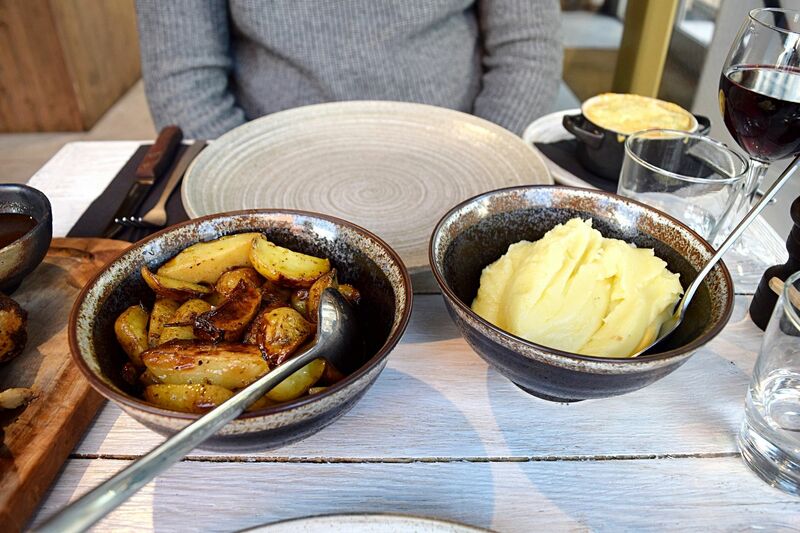 We both thoroughly enjoyed the meal at Cocotte and although Notting Hill and Westbourne Grove is quite away from us, I would happily travel to eat there again and I am definitely planning to. The chicken was absolutely delicious as were the sides. One thing that can’t go without a mention is to keep an eye out for the flamingo and chicken wallpaper in the loos! If good chicken and good pricing is your thing I would definitely recommend you visit Cocotte. 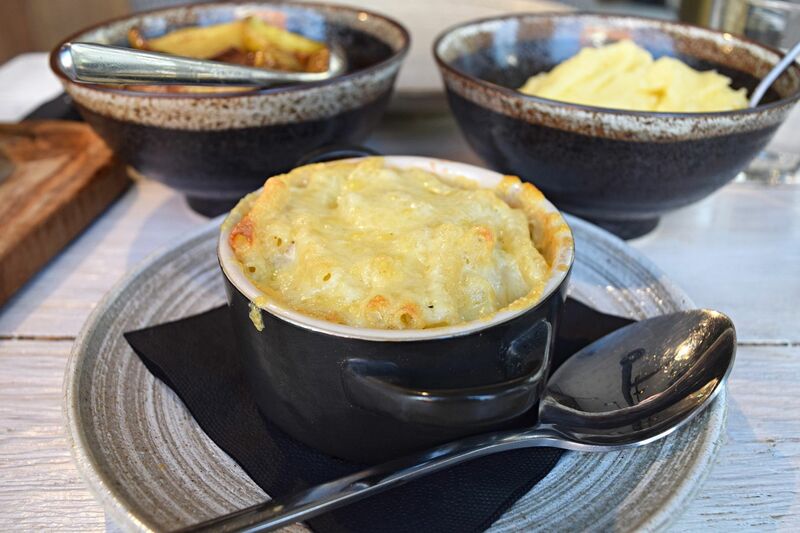 For more info or to view the menu and book visit mycocotte.uk. Next ArticleWhat’s In My In-Flight Beauty Bag?